SoundTek Music is committed to offering best products to the consumers in the Outlet. However, we do not sell brand new products in our Outlet. All products are refurbished products with big discounts. The following are different types of our refurbished products. Good Condition: Products in “good condition” are basically new. They may have minor cosmetic imperfections like scratches (some have been out of the box). While they are not factory sealed, they are guaranteed to work perfectly. They include both the full manufacturer's warranty and SoundTek's 45-day 100% satisfaction guarantee. Mint Condition: These products are “like new” but the factory is seal is not intact. They are in good condition, but the packaging may be damaged in transit. These products come with a full manufacturer warranty. SoundTek Music offers consumers a 45-day 100% satisfaction guarantee. Red Tag: The products in “red tag” brand new with factory seal intact. Some are discontinued items, “B stock” and refurbished items. 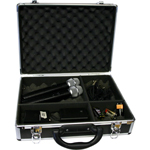 Soundtek Music offers the consumers the lowest possible prices and customer satisfaction.